This is a riff on a version I did a couple of months ago, which you can view here. I just adore ricotta cheese. It has a faint sweetness that really comes alive, when paired with chopped herbs, extra-virgin olive oil and ripe tomatoes. Sungold cherry tomatoes are a popular cultivar that consistently produces throughout summer and into the middle of autumn. Here in New York City, they’re available through all of October, although I suspect this weekend’s winter storm brought an end to that quickly. Roasting them at low temperatures for a long period of time transforms them into “tomato crack” — little chunks of concentrated sunshine with a sweetness that borders on overwhelming. You won’t be able to stop yourself from eating just a few. Recipe is as follows — 5 tablespoons sheep’s milk ricotta cheese (you can use any kind of ricotta cheese, from Polly-O in the supermarket to ricotta cheese from your farmer’s market; sometimes I use homemade); a generous handful of Italian parsley; a smaller handful of mint; 1/3 cup reserved pasta cooking water; 1 heirloom tomato, chopped; salt and pepper to taste; extra-virgin olive oil and 1 pint Sungold cherry tomatoes. Halve the Sungolds, sprinkle with salt and pepper, drizzle with olive oil, then roast at 200 F for 5 hours. Prepare pasta, drain. Stir in reserved pasta cooking water tablespoon by tablespoon or until desired consistency is reached (I like the sauce a little thick (remember that once you combine it with the warmed pasta, it will thin out a little bit)), taste for salt and pepper, stir in parsley and mint. 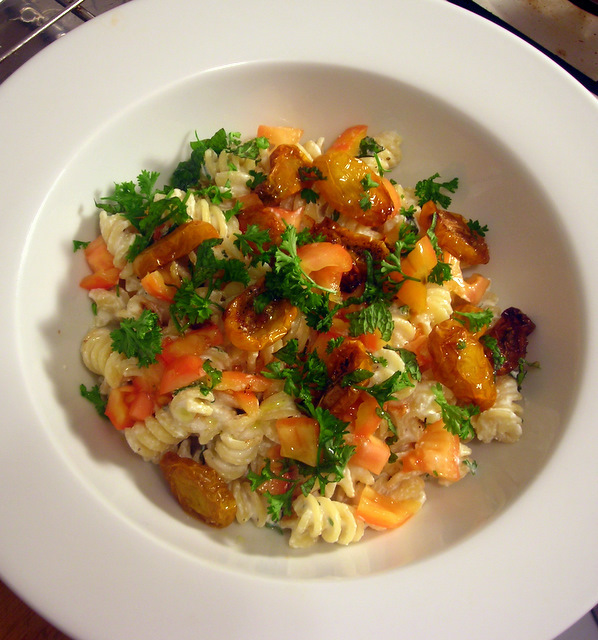 To assemble, toss pasta with ricotta mixture, top with roasted tomatoes, scatter chopped heirloom tomatoes on top, taste once more for salt and pepper, scatter parsley and mint, then drizzle with olive oil and serve at once. Time: About 15 minutes, not including prep. Roasted tomatoes can be prepared in advance and will keep for up to one day in the refrigerator, covered. 30 Oct	This entry was published on October 30, 2011 at 3:25 am. It’s filed under autumn, food, vegetarian and tagged dinner, food photography, pasta, tomatoes. Bookmark the permalink. Follow any comments here with the RSS feed for this post. this looks absolutely beautiful! …sheep’s milk ricotta – lovely! Oh Lordy. Now you’ve gone and done it again. Delicious.